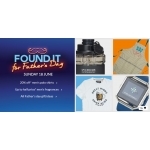 The Debenhams Promotion is on with up to 50% off father's day gifts. Free Standard Delivery on orders over £40. The promotion is valid online and in stores untill 18 June 2017.